Day 5: Gettin' What We Came For! 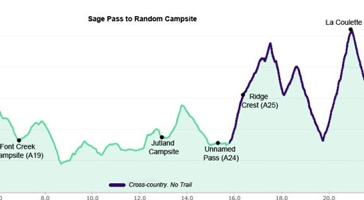 Elevation profile created by Zdenek on his 2014 GDT hike Thank you for allowing me to share these Zdenek! Today’s is just a partial of the first half of the day as we took an alternate not on the elevation profiles. Today’s section is said to be one of the most difficult of the whole trail. I’m still working on how I want to write these entries. 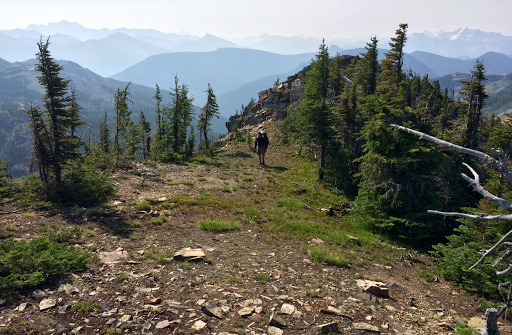 Totaling up mileage and elevation isn’t as simple as other trails. I can get my total for the day, but the effort it takes to figure out each piece as I explain it is really time consuming, so I may be more general some days than others. Today is one of those days. It was a full day of ridge walking wita lot of elevation gain/loss. I can say that we hiked from 6:30am-7pm and we averaged 1.5mi(2.4km)/hr. Yep, it was a physical one! 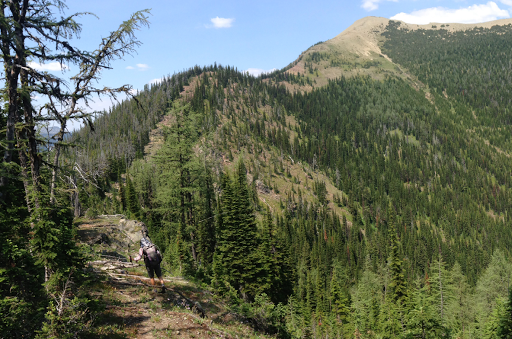 The hike we did was along La Coulette Ridge to to the summit of La Coulotte Peak. It’s only about 3mi/5km, but it was 1mi(2km)/hr pace. We started off from camp with some forested hiking. We could see part of the ridge we’d be hiking up in the distance. We had our first real usage of the GPS when we did a steep grassy hike up to the ridge for about 30min. 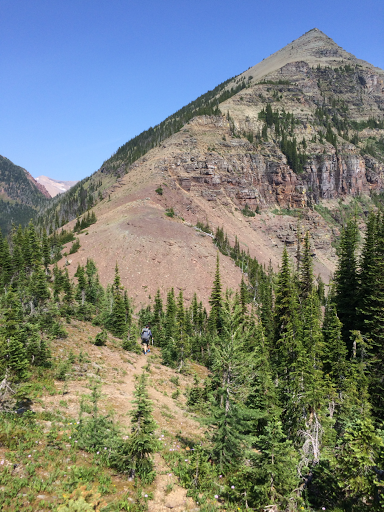 There wasn’t a trail on the ridge over than slight user trail from time to time, but it’s easy to know where to go since we just needed to walk the ridge. It had a ton of variety in that short distance. 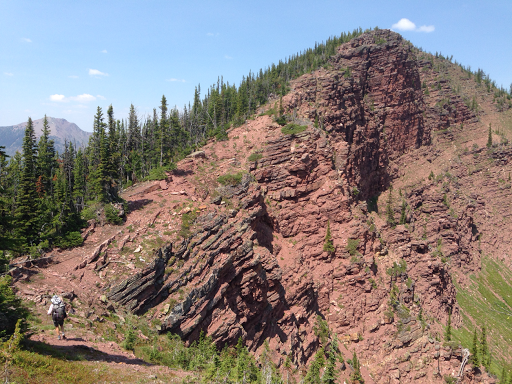 The final summit of La Coulette Peak was quite steep and had crumbly shale that made for slow going. We made it up by noon and had lunch up there to take in the views. It’s still hazy due to fires all around, but still amazing. 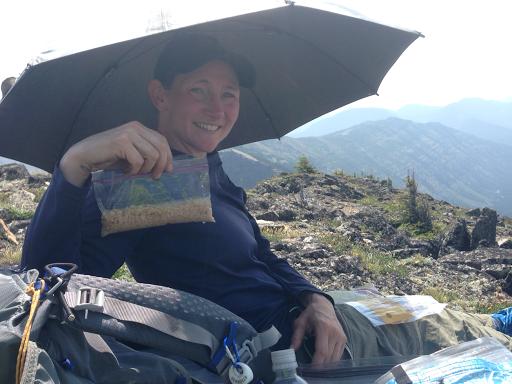 For lunch today, I had my dehydrated salmon for the first time. Those of you that read my pre trail entry know that I took half of my tuna and salmon packets and had my first experience with dehydrating. Btw, ladies, a nifty trick for a hands free umbrella during lunch…put the handle down your shirt and throug your sports bra. Works perfectly! I personally don’t know it’s worth the effort. Particularly with salmon and tuna. It smells quite a bit and I’m glad I keep all my food in big OP Saks (odor proof). It took 5-10mins to rehydrate and tasted just like the original salmon. It does save me 2oz of weight per packet and I have it everyday for lunch with a tortilla and string cheese, so it does add up. It also takes up less space without those foil packets. So, I don’t know that I’ll make the effort to do it again, but it worked! From the summit, GDTers have an alternate choice to make. Most do a bit more on a ridge and then drop down to a dirt road walk that later becomes paved and goes by Castle Mtn Ski Resort. 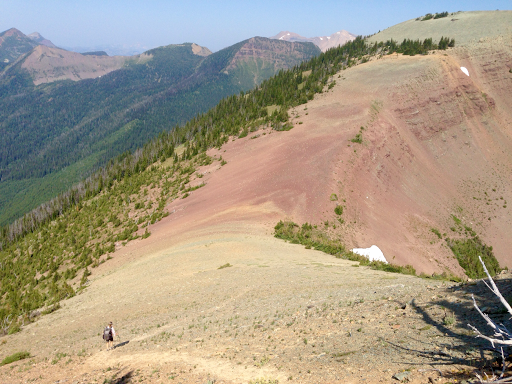 The other option is Barnaby Ridge which stays high and continues this pattern of difficult yet rewarding hiking. We decided to wait to finish the summit before we made a choice on if we had the energy to do the summit. We were both feeling energized and couldn’t have asked for clearer weather. There was a perfect slight breeze most of the day and that helped a lot. We both agreed that this type of alternate, though tiring and time consuming, is exactly what we came out here to do. We decided to go for it! 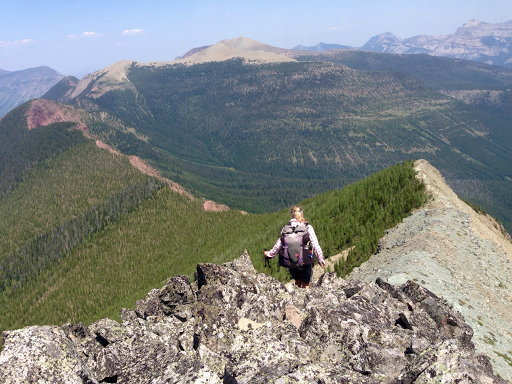 Here is a photo of E beginning Barnaby Ridge from La Coulette Peak. 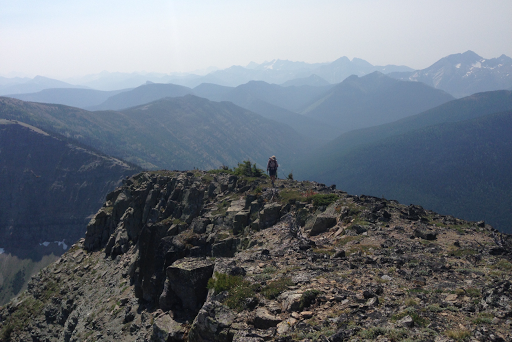 We will be on it for something like 10mi/16km and it will be just as slow going and physically demanding as La Coulette was with more scrambles, exposure, and bushwhacking. It really was worth it though! Here are some photos from the first third of it. 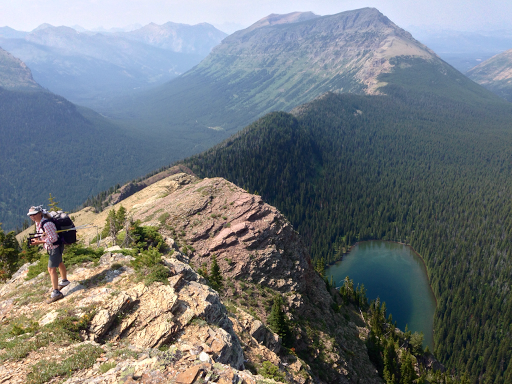 The only water was .3mi/500m off the trail down a steep trail to Grizzly Lake. We got down there at 4:30pm and knew we’d need to haul at least 4L(8lbs) out for the rest of the dry ridge walk tomorrow. E was in the mood for a beak and early dinner to save some of the water carry. 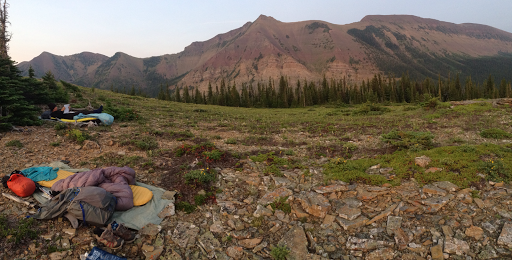 The weather was so perfect that our goal was to camp up on the ridge. Not advisable many nights, but tonight would be perfect. Again, this is exactly what we’re out here for. 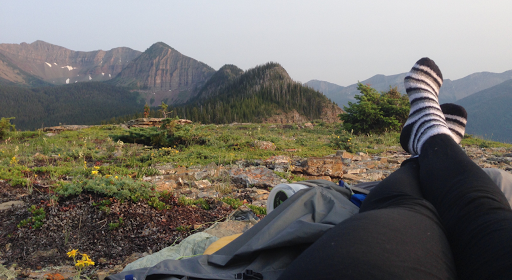 We can always camp by a lake, but how often will the opportunity come to camp on the Divide! 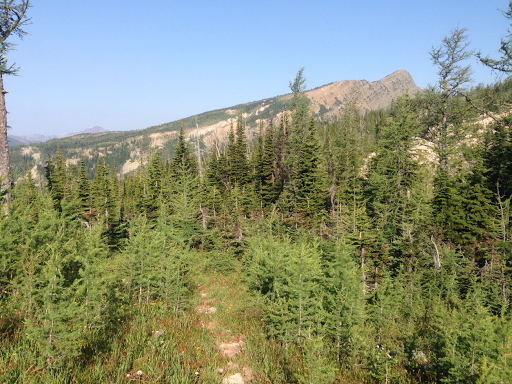 We saw what looked like a level and bare area in the distance along the ridge that we agreed to try for and split up. I hiked on and E would meet me at camp after she had her dinner. 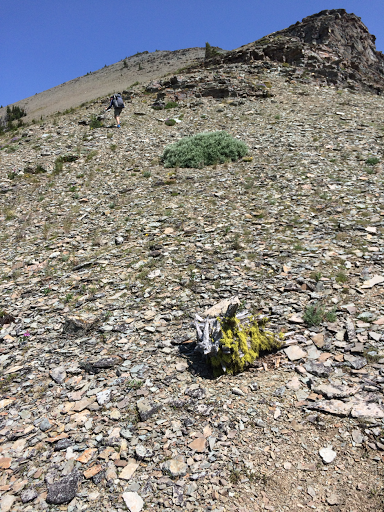 As luck would have it, as soon as I climbed back up to the ridge from the lake, it turned into a bushwhack. 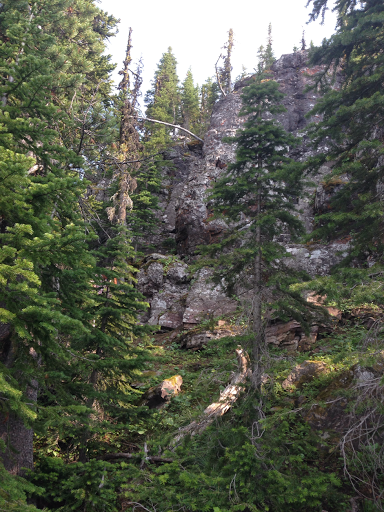 Then I came to a ~30ft/9m rocky cliff. It looked doable to scramble it without the pack, so being in my crazy Hayduke mindset, I took my pack off and attempted to lower it by twisting the top pack strap handle around my hiking pole. 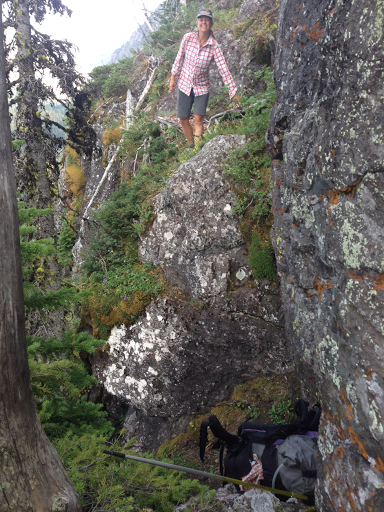 As I lowered it, the pack slipped off and tumbled down getting caught in the dense forest below. My water bottle flew out and I heard it tumble further downhill. Ugh, that was stupid and I was lucky it wasn’t worse. 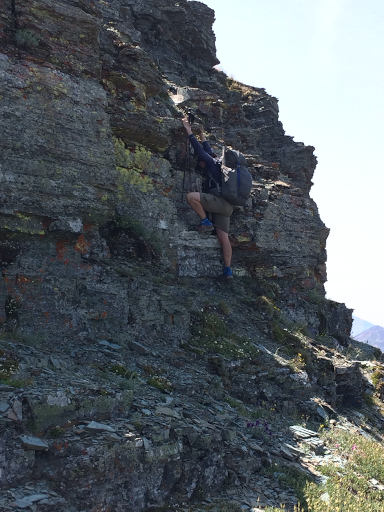 I wasn’t comfortable with the scramble down when I tried it and found another way down. It was still a bit sketchy and best done without a pack on. I decided to wait for E at this point since this wasn’t the safest spot and helping each other on the sketchy sections are part of why we are partnering up. I made dinner and E arrived not long after. We both were glad I had waited and she made it down much easier with me there to pass the pack to and point out where to go. 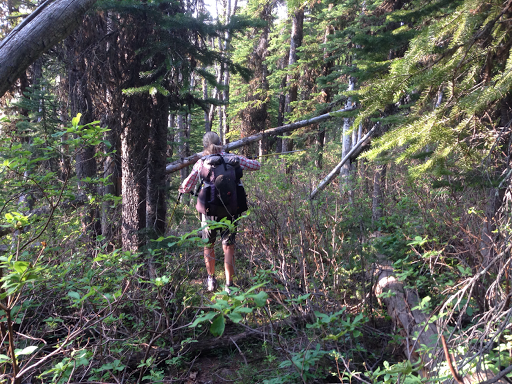 We hiked on and hit the more dense bushwhack for a mile or so before finally reaching our destination. It is awesome up here! We have a 360 degree view. We can see where we hiked from and where we are headed tomorrow. In addition, we can look down into the valley and see the road we’d be on if we were on the official GDT. We even decided to fully embrace this and cowboy camp! I know! I’ve only cowboyed once and E hasn’t done it in a decade. It’s such a rare opportunity and there are few bugs. The mosquitoes came out a bit after sunset, but now a slight breeze is up and they have cleared. It’s so nice so far that I don’t even need to zip my sleeping bag and am using it as a blanket.